The Spirit of Canada hot air balloon. Peter Calamai, “Lots of hot air and a high old time.” Canadian, 26 August 1967, 14. Greetings and salutations, my reading friend. Yours truly would like to offer you something special this week. If you don’t mind, I would like to step aside from our usual and anniversarial approach in order to deal with an acquisition received in March 2004, 15 years ago this month, by the Canada Aviation Museum, today’s Canada Aviation and Space Museum, in Ottawa, Ontario. This acquisition, say I, illustrates the breadth and depth of the stupendous collection of this national museum. So, are you ready? Yes? Let’s go then. And yes, the illustration at the top of this article was extracted from the 26 August 1967, yes 1967, not 1969, issue of Canadian, the weekly illustrated supplement of The Toronto Daily Star, one of the great Canadian daily newspapers of the age. Our story began, no, not in March 2004. It did not begin in July 1999 either, with the reception of a first batch of material from the same source / donor. Our story, say I, began much earlier than that, in 1936 to be more precise, in North Grimsby Township, near Saint Catherines, Ontario, with the birth of Stanley John “Stan” Sheldrake, the aforementioned donor. Fascinated by aviation since childhood, this gentleman began to fly at the ripe old age of 17. Indeed, Sheldrake earned a private pilot licence in 1954, after taking classes at the Calgary Flying Club. As exhilarating as piloting a light / private aircraft could be, Sheldrake soon became intrigued by the idea of jumping out of a perfectly good aircraft to see how it felt like. In other words, he developed a passion for skydiving / parachuting. An active member of the Saint Catherines Parachute Club, in Saint Catherines, one of the oldest, if not the oldest in Canada, Sheldrake made 350 or so jumps. He may even have opened a skydiving school in the early 1960s. As you undoubtedly know, my ever more knowledgeable reading friend, skydiving was an aerosport recognised since 1951 by the Fédération aéronautique internationale, the Paris-based governing body for all manners of aeronautical records. Admittedly far less popular than baseball or hockey, skydiving was nonetheless making its mark on the world of sports. Its popularity even led to the creation of an American weekly television series. Ripcord first hit the airwaves in June 1961. Its main protagonists were 2 professional skydivers who owned a small fictitious company. The final episode of the series was aired in September 1963. Yours truly has vague recollections of watching episodes of the dubbed version of Ripcord, Les hommes volants, at some point in the mid to late 1960s. It seems I was not the only viewer. Would you believe that a skydiving club from Montréal, Québec, an important one in the late 1960s, was called Les hommes volants Incorporé? Incidentally, I recently came across 2 very interesting comic book characters with a strong link to skydiving. These out of the ordinary female characters, Sue and Sally Smith, Flying Nurses, made their appearance in the United States, in their own comic book, around November 1962. Joltin “Joe” Sinnott, a member of the prestigious Will Eisner Comic book Hall of Fame since 2013, drew these brave and independent twin sisters and parachute nurses of the Emergency Corps, a fictitious medical group based in the United States that provided assistance around the globe. He also wrote the scenario of their adventures, which ended around November 1963. Sinnott went on to ink virtually all the major titles of comic book giant Marvel Comics Incorporated, a firm known in 2019 as Marvel Worldwide Incorporated. Who was this Eisner guy, you ask, my reading friend? You’re kidding, right? You don’t know who William Erwin “Will” Eisner was / is? Really? I am shocked and appalled. Eisner was / is one of the cartooning giants of the 20th century, but back to our story. As many Canadians from sea to shining sea prepared to celebrate the centennial of Confederation, in 1967, a few adventurous ones were envisioning the possibility of bringing balloons to the party. Big ones. Really big ones. One of these flying enthusiasts was, you guessed it, Sheldrake who, at the time, was a 30 or so year old father of 3 and an insurance salesman. What’s this, my reading friend? You want to know what lighting gas / coal gas was / is? May I refer you to a November 2018 issue of our blog / bulletin / thingee where this gas mixture was mentioned? Oh, I see. You are a wee bit lazy, you know that. At the risk of sounding pedantic, dare I say sarcastic, lighting gas was / is a lighter than air gas mixture produced from coal and used for lighting. Available in large volume during much of the late 19th and early 20th century, this highly flammable gas was far less expensive and much easier to obtain than another equally flammable lighter than air gas you may be more familiar with, namely hydrogen. The catch was that lighting gas provided a lot less lift than hydrogen, or helium for that matter. A non flammable lighter than air gas, helium was not used to fill balloon until 1923 or so, however, but back to our story. Modern hot air ballooning was still in diapers, figuratively speaking, when Sheldrake and a fellow skydiver and childhood friend by the name of Kenneth “Ken” Merritt developed an interest in this endeavour, in 1964, after coming across some of the earliest magazine accounts of the pioneering work done in the United States by Paul Edward “Ed” Yost. Thoroughly fascinated, Sheldrake and Merritt decided to build their own balloon. It is possible that the idea of buying one never occurred to them. Sheldrake and Merritt’s first task was to find information. They contacted engineers, balloon clubs and various companies in 5 countries. Even though the latter preferred to sell rather than talk, an engineer at Goodyear Aerospace Corporation put our friends in contact with the Aerostat Society of Australia. This organisation gave them a balloon design formula and a source for a type of polyester fabric normally used to make boat sails. Given that modern hot air ballooning was born in the United States, the engineer’s suggestion that Sheldrake and Merritt contact a group in Australia seems a bit odd, but let’s not dwell. By October 1966, the balloon was slowly taking shape, at Sheldrake’s home in Smithville, Ontario. Using the $ 2 000 that had borrowed from a bank, they gradually bought the required materials. As the days turned into weeks, Wilfred Jussen, Douglas “Doug” Hysert and Frank Duck joined the team. 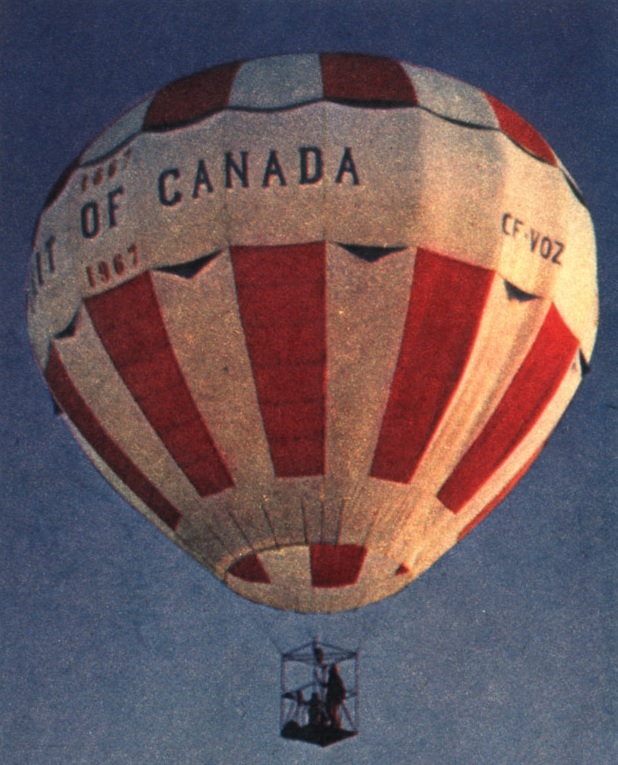 Very much aware that their balloon would have to be looked at by inspectors from the organisation with powers to regulate all aspects of civilian aviation in Canada before it would be allowed to fly, they duly contacted the Department of Transport (DOT) at some point in late 1966 or early 1967. It goes without saying, but yours truly will say it anyway, that this department had no standard or procedure whatsoever relating to balloons or ballooning. As the weeks turned into months, its inspectors visited Sheldrake’s basement balloon factory on 5 occasions. In January 1967, the 5 men attended the fifth annual Saint Paul Winter Carnival Hot Air Balloon Race, in Saint Paul, Minnesota. Would you believe that none of them had seen a balloon from up close before that time? While in Minnesota, our friends met pioneer aeronauts / balloonists like Donald Louis “Don” Piccard and Deke Sonnichsen. They learned a great deal about the subtle art of balloon inflation and flight. The team also heard about plans for an exciting competition proposed by Sonnichsen, the Palm Springs Aerial Tramway International Balloon Race, to be held in Palm Springs, California, as part of a long standing event known as Desert Circus Week. Bubbling with enthusiasm, the team completed its balloon. Spirit of Canada, as it was called, was ready to fly in early April 1967. It was successfully inflated on 9 April, but did not fly. There was too much wind. The people and journalist(s) present that day were somewhat disappointed. Sheldrake test flew Spirit of Canada on 11 April. Like his fellow team members, he had no training or experience. The flight lasted only 8 minutes. After climbing to 150 or so metres (about 500 feet), Sheldrake sideswiped a huge oak tree as he tried to land. The enveloped of the balloon was seriously damaged. As repairs took place, the DOT issued a registration certificate for Spirit of Canada on 14 April. The flight permit issued at that time stated that it could fly only during daylight hours, in visual flight rules weather conditions, outside controlled airspace. As was the case with homebuilt aircraft, the balloon could not carry passengers, at least initially. This restriction was pretty much superfluous since Sheldrake did not have a balloon pilot licence and could not carry passengers until he got one. Again, it goes without saying that DOT only had draft regulations for licensing balloon pilots. These documents required that the person aspiring to be a pilot perform at least 8 flights lasting an average of 2 hours. It yet again goes without saying that DOT did not have a qualified balloon flight instructor. As a result, the department concluded that Sheldrake would have to meet its requirement by doing 16 hours of solo flight. In any event, having repaired the envelope of Spirit of Canada, Sheldrake and his friends drove to California to fly with experienced American aeronauts. They left behind the large, heavy and cumbersome steel tube nacelle used for the first flight. Sheldrake would fly with a small, light and easily disassembled wooden nacelle made by Hysert, who happened to be a carpenter. The steel tube nacelle was rarely used from that point onward. Sheldrake and Spirit of Canada made their second flight in Palm Springs on 21 April, under the supervision of Sonnichsen. It so happened that the organisation with powers to regulate all aspects of civilian aviation in the United States, the Federal Aviation Administration (FAA), did not expect aspiring pilots to complete a specific number of flights lasting an equally specific amount of time in order to obtain a balloon pilot license. Because of this, Piccard, who was an FAA examiner, was able to issue an American balloon pilot licence to Sheldrake. Sheldrake’s third flight was the one he performed at the aforementioned Palm Springs Aerial Tramway International Balloon Race. The 7 balloons went up near the top of San Jacinto Peak, at an altitude of about 2 500 metres (8 200 feet). The winner would be the one who covered the longest distance in an hour. The equally aforementioned Yost won the race. Sheldrake came in fourth, and won a $ 500 prize. He had covered a distance of more than 19 kilometres (about 12 miles) in about 49 minutes. Sheldrake and Spirit of Canada made their fourth flight in Hamilton, Ontario, on 14 May, at a Centennial international air show. If truth be told, theirs was the first flight of the day. A crowd of about 60 000 people cheered as Sheldrake soared into the sky. The landing did not go as planned. It was a windy day and the balloon hit the ground hard. Sheldrake broke his nose when he hit a fuel tank. He was rushed to a nearby hospital and underwent surgery. Sheldrake spent almost a week there. The Hamilton flight is worthy of note because the Canadian Post Office Department recognised it as the first during which a balloon carried mail in Canada. Stanley John Sheldrake, on the left, and Kenneth Merritt. Both men wore helmets for safety when flying Spirit of Canada. Peter Calamai, “Lots of hot air and a high old time.” Canadian, 26 August 1967, 11. All in all, Sheldrake made more than 24 flights during the summer of 1967, many of them at Centennial events. By April 1968, he had the 16 hours of flight experience required by DOT. By then, said department had a written exam ready for use. Sheldrake passed it with flying colours. He was the first person to write an exam for a balloon pilot licence in Canada. Sheldrake’s balloon pilot license, the first in Canada of course, was issued on 13 June 1968. This being said (typed? ), a contemporary source stated that a gentleman from British Columbia by the name of Zygmunt Skorupski obtained a balloon pilot license in early 1967. One has to wonder if that license was not an American one. Yours truly has yet to find any information on this individual, but back to our story. Given that his licence granted him the privilege to train aspiring balloon pilots, Sheldrake lost no time in providing training to the other members of the team. This unusual privilege, which may have been revoked some / many years later, played a significant role in the rapid increase in the number of balloon pilots in Canada. A flight that yours truly would like to highlight in this article is the one that took place in late June or early July 1967, in Ottawa, from a field in front of the National Museum of Science and Technology, today’s Canada Science and Technology Museum, a sister / brother museum of the Canada Aviation and Space Museum. Sheldrake slipped the surly bonds of earth with an illustrious passenger, Robert William “Bob” Bradford, the curator of the museum’s aviation and space division and future director of the National Aviation Museum, today’s Canada Aviation and Space Museum. A finer gentleman that him would be hard to find. Bradford was / is also one of the famous and best Canadian aviation artists of the 20th century. The collection of the Canada Aviation and Space Museum includes many of his paintings. And yes, you would be correct in thinking that Sheldrake’s flight was the first held in Ottawa for a great many decades. The flight at National Museum of Science and Technology was but one of the many activities prepared by the staff for the museum’s first 1 July related annual celebrations. More than 20 000 people also saw 10 vintage and antique automobiles move about. As well, they watched in awe as a gigantic railway crane was put through its paces. Spirit of Canada also carried 300 especially cacheted envelopes commemorating this flight, as well as the one made in June 1858, in Ottawa, by one Thaddeus Sobieski Constantine Lowe. Would you believe that this flight was one of the first, if not the first made by this gifted, famous and somewhat arrogant American aeronaut? Would you be terribly upset, or more upset than usual, my reading friend, if yours truly took this opportunity to pontificate on Lowe? It so happens that this gentleman was heavily involved in one of the deadliest conflicts of the 19th century, the American Civil War. In the spring of 1861, as the conflict began, a few aeronauts offered their services to the legitimate Union / Unites States government led by Abraham Lincoln. Of the lot, only Lowe had the contacts that would enable him to finance a demonstration in Washington, District of Columbia, near / on the present-day site of one of the world’s most famous aerospace museums, the Smithsonian Institution’s National Air and Space Museum. On 18 June 1861, Lowe, a telegraph operator and an employee of the American Telegraph Company made a captive flight on board Enterprise. It has been suggested that this gas balloon was named in honour of the balloon used at the battle of Fleurus, L’Entreprenant. Yours truly is not so sure, but let’s not dwell. In any event, the telegram sent to Lincoln and the commander-in-chief of the Union army, Lieutenant-General Winfield Scott, was the very first to be sent from a flying machine. It came as a bombshell; newspapers devoted whole columns to Lowe and his venture. And yes, Enterprise was / is / will be the name of the starship commanded by James Tiberius “Jim” Kirk, a flamboyant if fictitious film and television character mentioned in a November 2018 issue of our blog / bulletin / thingee. What’s this? You have no idea of what the battle of Fleurus or L’Entreprenant were / are? Sigh. To paraphrase Miranda Priestly, the formidable fashion magazine editor of the very successful 2006 movie The Devil Wears Prada, I’m very disappointed. Brief history lesson and yes, there will be a test. The year was / is 1793. The young French republic was struggling to survive, facing a large coalition of hostile states that included the United Provinces (today’s Netherlands), the United Kingdom, Spain, Russia, Prussia and Austria. In April, in an effort to better use the country’s best brains, the government’s highest authority, the Comité de salut public, created a body to study new weapons. The Commission aux Épreuves was headed by an influential member of the committee, Louis-Bernard Guyton de Morveau, whose fascination with ballooning dated back to 1784. That year, in April, the French chemist flew aboard a balloon of his own design that he had fitted with oars, to control its flight. And yes, the oars proved utterly useless, but back to our digression. Guyton de Morveau soon convinced his colleagues on the Comité de salut public of the potential importance of having captive observation balloons over battlefields. Around mid-July, he submitted a report to this effect. The committee unanimously endorsed the plan, provided scientists could find a way to produce the hydrogen needed without using certain rare commodities, such as sulphuric acid. Early trials were so successful that the Comité de salut public immediately despatched a balloon to the front. The commanding officer of the army it was assigned to showed little enthusiasm, and neither did his troops. Worse still, the balloon was already a bit damaged, and could not keep up with the troops as they moved. It was returned to Paris. On reading the report prepared by Jean-Marie Joseph Coutelle, a well-known chemist and physicist who had accompanied the balloon, the Comité de salut public ordered that a balloon testing and manufacturing centre be set up near Versailles. Coutelle was appointed to head up the experiments. Would you believe that he was an old collaborator of Jacques Alexandre César Charles, a man full of spirit and enthusiasm, the most popular lecturer physicist in Paris in the early 1780s and the man who stick handled the design and fabrication of the world’s first gas balloon? On 1 December 1783, Charles test flew this balloon with 1 of the 2 skilled manufacturers of physics instruments, 2 brothers if you must know, who had helped him, but back to our digression. Again. Sorry. What can I say, I like balloons. Coutelle test flew the first captive balloon constructed at the new centre, L’Entreprenant, in late March 1794. The Comité de salut public was most satisfied with the results of the trials. In early April 2, it ordered the formation of a company of balloonists, the world’s first military air unit. Coutelle was named commander. It is worth noting that a unit of the Militia based in Montréal, Québec, the 65e régiment (Carabiniers Mont-Royal), formed a more or less official company of balloonists which borrowed, on several occasions, around 1911-12, both the French-made gas balloon owned by La Presse, a very successful newspaper, and its French born pilot, Émile Barlatier, the paper’s mechanical sports editor. This somewhat ephemeral company of balloonists was the first military air unit in Canada. Err, where were we? Oh yes. Events began to unfold quickly after Coutelle’s nomination. In early May, the company of balloonists travelled to Maubeuge, in northern France, to support the efforts of its defenders. Coutelle and an officer went up for a test flight in early June. The French army cheered them on. In the enemy camp, the reaction was quite different. Officers and soldiers were thoroughly puzzled by this strange apparition. They had no idea of what it was doing up there. They soon found out. Day after day, the crew of L’Entreprenant observed everything that went on the battlefield and gave up to the minute reports to the French commanding officer. Despite every effort, the artillery of the enemy could not touch the balloon. The delighted Comité de salut public ordered 6 more balloons. The company of balloonists was ordered to join French forces fighting in the Austrian Netherlands, today’s Belgium. It left Maubeuge, which was all but surrounded, in the dead of night. Flying operations resumed in the Austrian Netherlands in late June. Soon after, the company of balloonists was ordered to go to a plateau near Fleurus. For more than 10 hours, Coutelle and an officer watched as the battle raged, reporting all that happened. In the end, the enemy forces retreated. An astounded French officer quipped that an army without a balloon was like a duellist fighting blindfolded. A second company of balloonists was formed in June 1794, followed in October by the founding of a ballooning school. In the meantime, L’Entreprenant continued to fly. The prospects for the future, promising as they were, soon changed as the style of combat changed, from static warfare to mobile warfare. Balloons, which took time to move and be made ready for flight, proved cumbersome. Some officers also seemed jealous of the balloonists’ reputation. In 1795, the second company of balloonists made its way to Strasburg, and was to spend 3 idle years there. Worse still, the first company was captured in 1796. The balloonists were released the following year. The despatch of this unit to Egypt with the expeditionary force led by a brilliant young general mentioned in a December 2017 issue of our blog / bulletin / thingee, Napoléon Bonaparte, born Napoleone di Buonaparte, came to a sudden end when the ship carrying the materiel, minus the balloon, sank in July 1798, in Alexandria’s harbour. In February 1799, acting on the recommendations of Bonaparte, the French government disbanded the ballooning school and the companies of balloonists. But back to our story. Finally. Sorry. Sorry. Despite the success of his Washington demonstration, Lowe’s status with the Union army was still very uncertain owing to the presence of a rival aeronaut, John Wise, who had been commissioned by the head of the Union army’s Corps of Topographical Engineers, Major Hartman Bache, to provide an observation balloon. The envelope of said balloon was unfortunately destroyed in July as it was being transported. In late July, Lowe made an untethered reconnaissance flight over Washington to see if forces of the Confederate States of America (CSA) were preparing an attack. He was fired on by Union army soldiers, and landed in the middle of a Confederate-occupied sector. In the evening, Leontine Lowe, disguised as a farmer’s wife, went to retrieve her husband and his balloon. Embarrassed by the incident, Lowe again went to see Lincoln, who wrote a note asking Scott to meet with the aeronaut. Scott, unfortunately, put no stock in balloons. Unable to meet him, despite several attempts, a furious Lowe complained to Lincoln, who went with him to Scott’s office. A week later, Lowe became the official balloonist of the Union army. In late August, he was even commissioned by Bache to construct a brand new observation balloon, Union. In the weeks and months that followed, Lowe gradually consolidated his position. His many observation flights were so effective that the infuriated CSA forces were forced to camouflage all of their positions. The aeronaut, moreover, could count on the support of the commanding officer of an important army, Major General George Brinton McClellan. Thanks to him, Lowe finally received permission to build 6 more balloons and to establish a corps of military balloons, to be flown by pilots who would remain civilians. In August, a rival of Lowe, John La Mountain, took to the air to observe the CSA positions in Virginia. This otherwise ordinary flight was / is worthy of note because he took off from the deck of a small Union army transport vessel – a world first. That same month, the Union army purchased a barge which, once modified, became the first aircraft carrier to be put into service. A balloon based on the George Washington Parke Custis carried out its first mission in November 1861. Oddly enough, the Union balloonists were unfortunately under-utilized. Some were even ridiculed by officers. The stunts and overall conduct of many pilots did not help the cause of ballooning. All in all, balloons played an important role during only one battle, in May / June 1862. The removal of McClellan, in November, deprived Lowe of his only important supporter in the Union army. He made his last flights in May 1863. The balloon corps disappeared soon after. This being said (typed), several civilian aeronauts who had served under Lowe continued to fly. In August 1863, a German American aeronaut by the name of John H. Steiner, born Johann Steiner, made a brief tethered flight with a cavalry officer in the army of the kingdom of Württemberg, a member state of the German Confederation. Having paid his way to the United States, like a number of his European colleagues, to see what a modern conflict looked like, the young lieutenant was thoroughly delighted by his flight. His name was, you guessed it, count Ferdinand Adolf August Heinrich von Zeppelin. And yes, he was mentioned in December 2017 and December 2018 issues of our blog / bulletin / thingee. Did you know that a descendant of Lowe by the name of Florence Leontine « Pancho » Lowe Barnes was the owner of a bar in the western United States that proved very popular with American test pilots of the late 1940s and 1950s? You did? I’m impressed. And here’s the test. True or false, did the nacelle of the French balloon captured in 1796 survive, maybe, until at least the start of the First World War? Come on, that’s an easy question. The answer is True. Yours truly remembers seeing a photo of that nacelle in an early 20th century magazine. At least, I think I do. I’m getting old, you know, but back to our story. Like many before / after him, Sheldrake believed that he could make money with a balloon. In 1968, he put aside demonstration flights in favour of a full time commercial ballooning operation with several promotional contracts. Indeed, Sheldrake built 2 more balloons, for a Canadian brewing giant, Labatt Brewing Company, as part of this endeavour. The first, the so-called Blue Balloon, was registered in June 1969. The second one, which may have been unnamed, followed in 1970. Sheldrake flew Blue Balloon and Spirit of Canada on several occasions during the summer of 1969. He flew the former on behalf of Labatt Brewing, while the latter was flown on behalf of an American company, Minnesota Mining and Manufacturing Company, a firm better known as 3M. It so happened that the latter was promoting its Scotchguard fabric protector with the catch phrase “Fearless Fashions.” And yes, you guessed it, Sheldrake was soon billed as Captain Fearless. Marketing people at Labatt Brewing also liked this name, although they preferred the more colloquial Capt’n Fearless. Even though Sheldrake readily admitted he was not fearless, both monikers stuck. Sheldrake’s ballooning activities involved a lot of brief tethered flights at shopping malls and fairs. On 2 occasions, he flew as a helicopter carrying a film crew for Labatt Brewing commercials filmed Blue Balloon on a bright sunny day. The second flight took place in the Rocky Mountains, west of Calgary, Alberta, in late May 1970. An unforeseen change in wind direction took Sheldrake west rather than east. As soon as the film crew in the helicopter got the footage it needed, he dropped down to tree top level. The nacelle of the balloon got caught between 3 trees sticking out from a ledge. A mountain rescue team from Calgary spent 8 or so hours getting Sheldrake and the balloon down. Sheldrake flew Labatt Brewing’s balloons all over Québec, Ontario and western Canada until 1975. Having realised that the envelopes of hot air balloon deteriorated because of the heat of the burner, as well as the wear and tear of being unpacked, inflated, flown, deflated and repacked, he made new ones for both Labatt Brewing balloons. Sheldrake also made a balloon, his fourth, for an individual by the name of Terry G. Stevenson. Sheldrake retired from ballooning in 1975. He could certainly be proud of his accomplishments. Sheldrake played a crucial role in introducing Canadians to hot air ballooning. He convinced DOT that ballooning was a legitimate form of flight, and proved that balloons could be a very effective advertising and promotion tool. Stanley John Sheldrake died in November 2008. He was 72 years old. He will be missed. Yours truly wishes to thank all the people who provided him with information. Any mistake contained in this article is my fault, not theirs. Be well, my reading friend, and do come back.